I've written in the past about making Spotify work for independent artists and labels. It's difficult to do, but it's becoming more necessary every year, as music streaming continues growing in popularity at the expense of music sales. Music sales are certainly down around these parts. Despite my putting iTunes links in the show notes for every episode on both this site and SoundCloud, this podcast sold a grand total of 92 items on iTunes in 2015 — less than four and a half sales per show. That stat makes me wonder if those links are worth the effort anymore. On the other hand, Spotify payouts seem awfully slim. One label's latest calculations have Spotify paying only four tenths of a penny per stream. Compare that to $0.70 to $0.90 per track sold on iTunes, depending on the sale price. At those rates, it takes between 175 and 225 Spotify streams to equal one sale. That said, it would take a mere 36,000 streams to generate more revenue than all those iTunes links I posted to the show notes in 2015. If music listeners are moving en masse to streaming, then what helps the artists I want to support more — getting one listener to buy a song, or getting a thousand listeners to stream that same song on Spotify at least once? Keep in mind that none of these yearbook playlists are complete; quite a few songs I've played in Yearbook episodes are not on Spotify for one reason or another. My hope, however, is that the artists that are on Spotify will benefit from Dave's Lounge listeners streaming these playlists. After all, I created this show to promote music I felt deserved more support. Spotify streams might not pay much, but they do pay, and that has to count for something. If there's enough demand, I'll continue to make more playlists like this. I'll also continue to generate iTunes and Bandcamp links for the few of you out there still buying music. If nothing else, it should add to the bottom lines of independent artists and labels, and ultimately, that's a big part of what this podcast is about. Comments are appreciated. Feel free to post them below. I had the opportunity to see Kawehi perform live in Raleigh last Saturday. The energy she puts into her performance is just tons of fun to watch. Also, her Ableton Live skills make me feel like a caveman rubbing two sticks together while she's cooking with gas. I've got a long way to go. Check out her tour dates on her web site, and when you meet her, tell her Dave sent you. Show #301 is in the can! You can hear it first on BeatLounge Radio on Sunday, January 25, at 6:00 PM ET / 2300 UTC. The episode will hit the podcast feed on January 30, though it might get to the Dave's Lounge App a bit sooner. From here on out, all show notes will include timestamps, so you can see when a particular song was played. This is the first episode in which I announce what each song is after it's played, rather than before. Do let me know how you like that format. There is new music from Natalie Walker in this episode. Yes. I'm rather stoked. That's all for now. 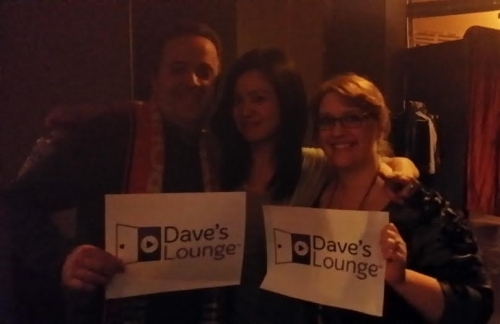 For more updates, follow Dave's Lounge on Twitter, Facebook, and Ello.